← Reflecting on the Entrepreneur’s Character: Arrogance or Time Mismanagement? Reflecting on our experiential learning from Lima, Peru. As I have done for the past five years, every January I embark with about 15 MBA students for a journey across Latin America’s “south cone”. This Year we started in Lima on January 5th, then we will visit Santiago (Chile), cross the Andes by bus and rest for a day in Mendoza (the wine country of Argentina) to continue to Buenos Aires and finish on January 19th in Montevideo (Uruguay). Our main theme is to observe nearshoring of global services as a channel of local frugal innovation and a driver of economic growth. In this new millennium, two trends seem unstoppable—globalization and the transformative influence of enterprise, and in particular the new young ventures (or start-ups) as the most efficient engine to deliver goods and services in the market economy. Instant communication is one of the key drivers of globalization and this is affecting how work is organized, distributed and performed — globally — in the enterprise. The advent of the Internet and the low cost of telecommunication services have changed the equation in how and where “screen-based-activities” are performed. In fact, most corporations, under global pressure to remain competitive, constantly seek new mechanisms to increase efficiency and productivity by adopting new technologies and relocating activities such as R&D, engineering, manufacturing, customer services, etc., to regions of the world where they are best positioned to provide the most cost effective element of their value chain. Over the last two decades we have observed acceleration in the migration of these screen-based-activities to Asia and other lower cost world regions. This Academic Global Immersion (AGI) will explore the opportunity that certain Latin American countries have to position themselves as a near-shore alternative to the traditional offshore destinations such as India, China and other low-cost regions in Eastern Europe and Southeast Asia. The fundamental question addressed will be: can countries like Argentina, Chile, Peru, and Uruguay compete as providers of offshore (nearshore) services? And if they do, what are the areas and the forms this competitive posture takes? A key scope of our studies is to identify what enables a country to compete? Is it simply the price/performance equation of the services offered in term of lower cost, high-grade human capital availability (with the quality and quantity desired) and a business climate that provides the confidence over the planning horizon? We all think there is more in this equation! As we left Lima after three extraordinary days of visits and meetings, I kept asking what were the three most critical takeaways from our visit. No doubt this is fledging and growing country in size and muscle. We met with former prime minister, and 2011 presidential candidate, Pedro Pablo Kuczynski, Wayra entrepreneurs, animation studies, gaming companies, Lima Valley, and many others. We networked with Peruvian graduate students, as well as other American MBA’s from Johns Hopkins and the University of Baltimore. The premier Peruvian business school CENTRUM Catolica hosted the event. (c) We all know empowerment is key for an entrepreneurial society. However, Spanish colonization and its dominance and role in phasing out the Inca empire have not played well for this region in terms of self-esteem as they felt their traditions and culture were inferior of those of the European conquistadores. This has been changing in the last decade(s) as they have regained their pride and confidence of what their culture has to offer to them and the world. We have seen a society bursting with confidence on who they are and where they are going. They shared generously with us their warmth, culture, gastronomy and confidence as the developed world struggles to reassert its sense of purpose and re-invent new formulas beyond their fiscal debt, public refinancing and different types of cliffs. We also learned that Peruvians were scared (and still are to some extent) of becoming entrepreneurs because of the fear that their ideas would be stolen and that failure would leave them stigmatized and limit their abilities to find jobs in their fields. 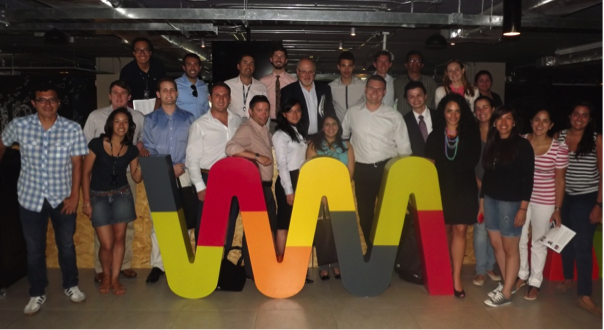 As we saw with all the young entrepreneurs at Wayra and Lima Valley, this is beginning to change. This was the first time we visited Lima as part of my class. We took a bit of a risk as we changed the formula that has worked for the prior 5 years. But the risk was very well rewarded as we all learned from the differences in the way business is done in Peru; experienced so many opportunities; made dozens of new friends; and expanded our business horizons well beyond our expectations. Thank you Peru and each one of you we met in Lima. I am sure we will meet again and our paths will cross in our personal and professional lives many, many times. Until we meet again or until my next posting from Santiago – Carlos B. Investor, thought leader, and advisor in areas of corporate innovation, born global entrepreneurship and global scaling. This entry was posted in My posts. Bookmark the permalink. Reflecting on Grapes and Wines: Any imminent disruption?